We are very pleased to announce and to invite you to submit relevant work to the 5th International Conference dedicated to the Variable Neighborhood Search (IC-VNS) which will be held in Ouro Preto*, Brazil, on October 02 to 04, 2017. VNS is a metaheuristic based on systematic changes in the neighborhood structure within a search for solving optimization problems. The main goal of the IC-VNS is to provide a stimulating environment in which researchers can share and discuss their knowledge, expertise and ideas related to the VNS Metaheuristic and its applications. All accepted papers for presentation will be published in a special issue of Electronic Notes in Discrete Mathematics (ENDM) journal. Abstracts are also allowed and if they are accepted, they will be published in the book of abstracts. 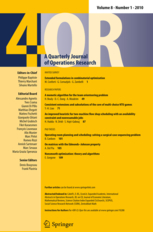 Special issues of International Transactions in Operational Research (ITOR) and Yugoslav Journal of Operations Research (YUJOR) will be dedicated to significantly extended and improved versions of the papers presented at the VNS 2017 conference. *Ouro Preto (Black Gold) is a former colonial mining town located in the “Serra do Espinhaço” mountains in the Minas Gerais state, Brazil, with a very rich and historical architectural heritage from the 18th century. The typical dishes of Ouro Preto highlight the diversity of people that have been living in this region. Ouro Preto is considered a World Heritage Site by UNESCO. We look forward to seeing you in Ouro Preto.